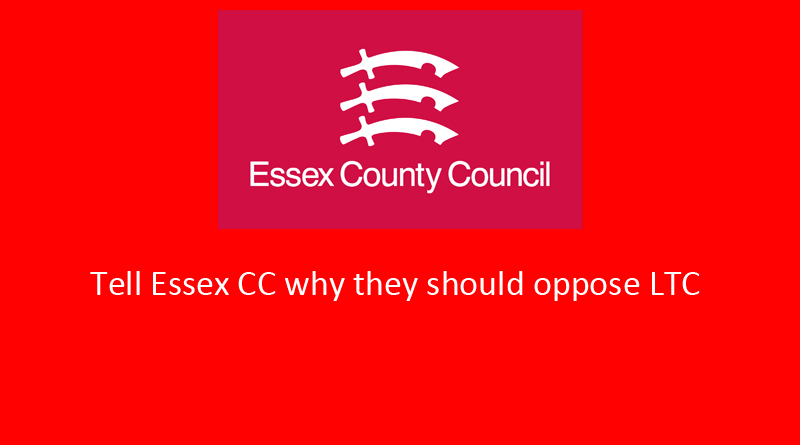 A motion is being presented at County Hall (Essex County Council) at Full Council 9th October for 10.00 AM to support Option C. This motion is being tabled by the Administration. We are emailing on behalf of the Thames Crossing Action Group who strongly oppose the proposed Lower Thames Crossing. We are aware that a motion to support the Lower Thames Crossing is being put forward at your Full Council Meeting on Tues 9th Oct.
We would ask you to review the information below and urge you to oppose the motion. There is nothing sustainable at all about the proposed LTC, it is destructive. It would destroy homes, communities, greenbelt land, agricultural land, ancient forests, and resident’s health and lives. The route can in no way be considered safe when it creates a toxic triangle that increases pollution levels in areas that are already suffering with illegally high levels of pollution. Only 14% of traffic that uses the current crossing will use the new route, that is taken from Highways England’s own figures. Do you really expect people to detour miles out of their way to use the new route unless there is a problem at the current crossing? We all know that by the time the current crossing blocks the M25 it will then be too late for traffic to detour to the new route, and the congestion will just be more widespread as traffic tries to cut through Thurrock and Kent between the two crossings. We are yet to see any hard evidence that LTC will bring economic benefits to the area, other than for the developers that benefit from the land grab that this project ultimately seems to be about. Please watch this video for some simple facts – https://www.youtube.com/watch?v=c8ivyYIbpH0 , we would also invite you to visit our website www.tcag.info. If you have any questions, we would be more than happy to discuss the matter with you, please don’t hesitate to contact us. Thank you for your time, we really hope you will consider opposing the motion rather than supporting this destructive and toxic route. If you wish to contact the Essex County Councillors to express your opinion and ask them to consider voting against supporting LTC, here are their emails ready for you to copy and paste into your email. We thought we’d do this to help out as it takes forever to go through getting each individuals email address from the Essex CC website!